The Blue Angels are the Navy's elite flight demonstration squadron renowned for their precision and grace showcased in each of their flight maneuvers. 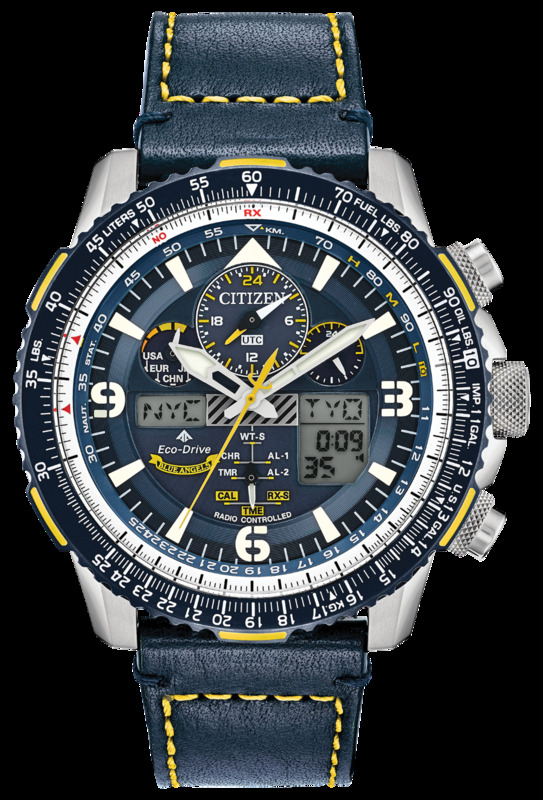 This precision and grace is exhibited in the CITIZEN Promaster Blue Angels Skyhawk A-T with precise atomic timekeeping in 43 cities. Other features include a chronograph, perpetual calendar, dual time, alarms, countdown timer, digital backlight and UTC display, power reserve and pilot's rotating slide rule bezel. This model appears in a stainless steel case, indigo blue italian leather strap with yellow contrast stitching, yellow accented dark blue dial and bezel with the Blue Angel's insignia replicated on the caseback. Featuring our Eco-Drive technology – powered by light, any light.